When the weather turns cooler and the fridge is full of veggies that really need to be eaten what else is there to do but cook soup? So out came the big pot for the stove, and the crockpot too, and I got to chopping veggies. For this one I used 4 onions, 4 teaspoons of minced garlic, half a bunch of celery – cooked in a couple of tablespoons of olive oil for a few minutes – then 4 parsnips, 4 carrots, a swede, 800g can of crushed tomatoes, 2.5L of beef style veggie stock (Massel cubes), a sploosh or two of soy sauce, 3-4 bay leaves and 1 cup of barley – simmered till the barley was tender – then I added 3 zucchinis and some mushrooms. 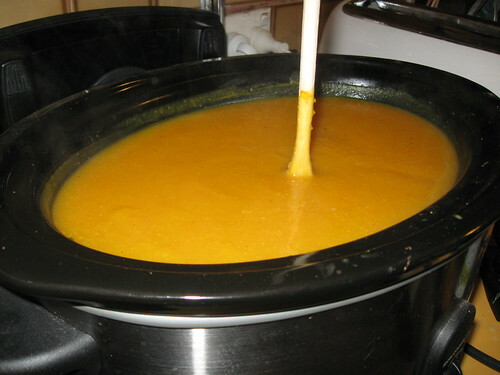 The pumpkin soup has 3 onions, 1/4 head of cauliflower, a whole butternut pumpkin, 2L of chicken style veggie stock and a generous sprinkling of black pepper and nutmeg all chucked into the crockpot and cooked on high for 6 hours before attacking it with a stab mixer. I know it has turned out right when the spoon stands up in it! 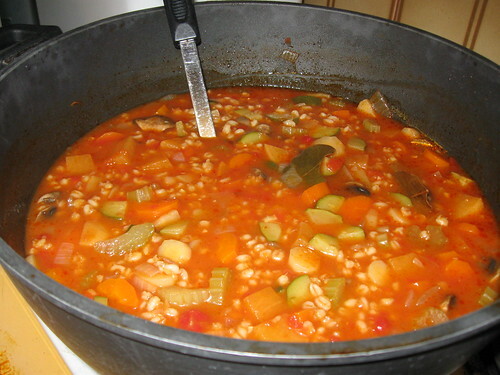 It all looks delicious, soup is one reason I look forward to winter. Mmmmmmm!!! Soup is my favorite food (well, after lobster, that is). Both pots look scrumptious. I could so live on that!